The Denver Broncos Third Level North End Zone includes all of the sections on the 300 level surrounding the north end zone at Sports Authority Field at Mile High. The Sports Authority Field at Mile High seating chart shows the Third Level North End Zone sections touching the much more expensive Broncos United Club seats in either direction. Denver Broncos Third Level North End Zone seats are spread among 15 different sections: section 316, section 317, section 318, section 319, section 320, section 321, section 322, section 323, section 324, section 325, section 326, section 327, section 328, section 329, and section 330. Every Third Level North End Zone seat provides a decent view of the game when the football is placed on the north side of the 50-yard line. As the action occurs farther away from the north end zone, the view from Third Level North End Zone seats gets progressively worse. Plays in the south end zone are difficult to follow from even front row seats in any north end zone section. Broncos Third Level North End Zone tickets are offered initially as season tickets of two preseason games and eight regular season games. A small proportion of tickets are left for individual game ticket sales. 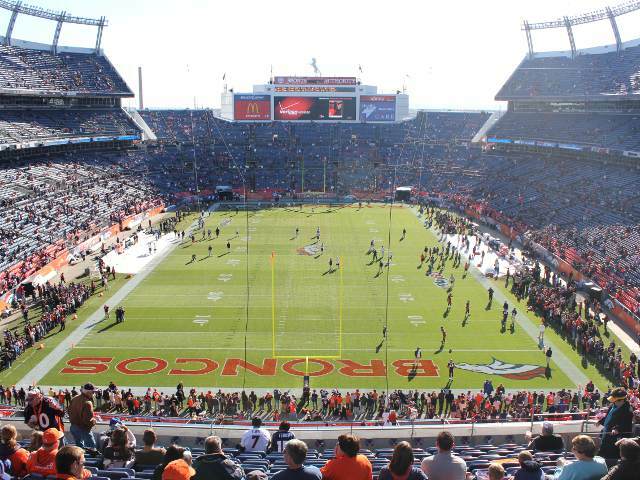 Current prices for Broncos tickets determines the full cost of Third Level North End Zone tickets. Prices for full season tickets are generally comparable with season ticket prices for Field / Plaza Level End Zone seats.